One of the most important poets of contemporary Japan, Makoto Ōoka's works continue to resonate powerfully among readers today. He speaks to the spirit, not of Japan and the Japanese, but of humanity, and of the world we are a part of. a book to be savored for a depth and beauty that surpasses any single cultural identity. 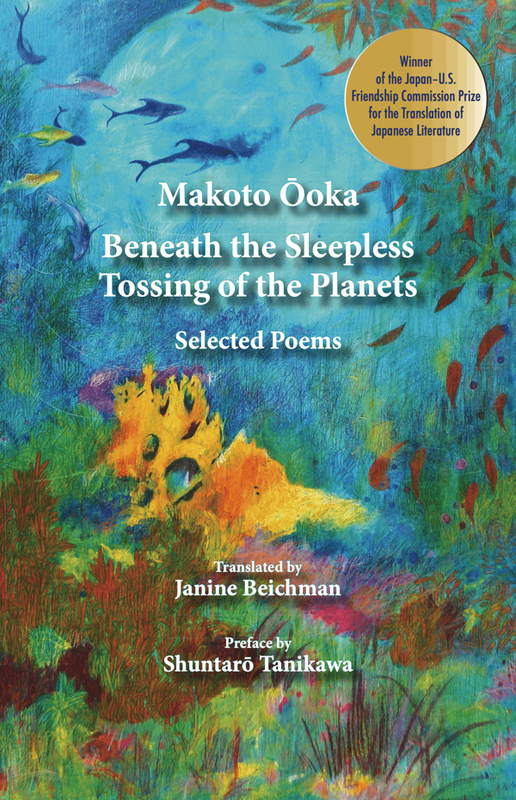 Additional information on Makoto Ōoka is also available on the Poetry Internationalwebpage. ...one of Japan’s most celebrated artists and intellectuals. While some of the poetry draws on Japanese themes, no particular knowledge of Japanese culture or literary forms is required to enjoy them. Ooka wrote about the human experience and whatever moved, delighted or surprised him: love, nature, family, dreams, places he visited and news events. ...a treasure chest for lovers of Japanese poetry and poetry in general. ...heartbreakingly beautiful in their simplicity and power. Beichman makes each line sing. How young and fresh these poems of Ōoka are! Full of joy and excitement, they fuse the ancient tradition of Japanese poetry with the modernism and surrealism of the West. Through Beichman’s translucent translations, polished over 25 years, they are now given a new life for all of us to share on this sleepless and tossing planet. The kinship of voice and temperament between poet and translator gives outstanding value to these translations. Spanning most of Ōoka Makoto’s career, they illumine the richness of his oeuvre. Ōoka’s spirit is vividly alive here. Coming so close to this poet's very essence is an overwhelming experience. Many of Ōoka Makoto’s poems are short and condensed; while they come across as philosophical, surrealistic, and nonchalant at the same time, in many cases they also straightforwardly describe a reality. They exist in the space between classical tanka and haiku poetry and modernist poetry of the Imagists. Janine Beichman, who is a poet and scholar of Japanese literature, delves deeply into the inner world of the poet and his works. Her translation brings out the profound insight hidden in the poems, casting a brilliant light on the skills the poet consciously develops to create his unique texts. Ōoka Makoto was a distinguished critic of Japanese poetry and a superb poet himself. He drew on both the centuries-old traditions of the Japanese waka and twentieth-century Western poetry, from surrealism to high modernism. In this collection, he is well served once again by the highly skillful translations of Dr. Janine Beichman, who worked with him closely during his lifetime. Dr. Beichman's English versions are faithful to the originals and at the same time creative in finding new means of expressing the spirit of the poems. It has been said that "It takes a poet to translate poetry," and this splendid collection is evidence of that. Makoto Ōoka (大岡信; 1931–2017) was the premier poet and critic of his generation in Japan and known abroad as an emissary of Japanese poetry and culture. By the time Ōoka was twenty-five, his first books—one of poems and one of criticism—had established him as a spokesman for contemporary poetry. He often visited Europe, Asia, and the United States, introducing Japanese poetry traditional and modern to foreign audiences through readings and lectures at the Collège de France, Harvard, Columbia, and Princeton Universities, and literary festivals. A major area of activity was linked verse, based on the traditional Japanese poetic form of renga. In the 1970s, Ōoka began experiments with this collaborative form in Japan and his pioneering endeavors soon brought him into contact with poets around the world. Ōoka’s works have also been translated into Chinese, Dutch, Estonian, Finnish, French, German, Korean, Macedonian, and Spanish. Janine Beichman, a noted translator and biographer of Japanese poets, received her PhD at Columbia University and is Professor Emerita of Daito Bunka University. She is the author of biographies of the poets Masaoka Shiki and Yosano Akiko, and the translator of Ōoka Makoto’s Poems for All Seasons/Oriori no Uta: An Anthology of Japanese Poetry from Earliest Times to the Present, as well as the poems in Abbess Kasanoin Jikun’s In Iris Fields. Her original English Noh play Drifting Fires was translated into Japanese by Ōoka Makoto. She is a judge for the JLPP Translation Competition of the Agency for Cultural Affairs of Japan and has received a numnber of awards for her work, including grants in 2018 from the National Endowment for the Arts and the PEN/Heim Translation Fund.